The Lenovo Smart Clock is a cute, 21st century take on a traditional alarm clock. It comes with Google Assistant, a 6W speaker and a display to update you on the time, weather and commute info – things you'd want to know when your alarm goes off. Warning: it doesn't show photos or video, and the larger Google Home Hub does all of this and more for just a little more money when it's on sale. The Lenovo Smart Clock wants to smarten up your traditional alarm clock, but really, it’s more than that. It’s a cheap way to get a Google Assistant smart home speaker adorned with a clock face on it and a special 'Good Morning' dashboard. At CES 2019, we got to test out the Lenovo Smart Clock, which will cost $79 (about £65, AU$110) when it launches anywhere from March to June –officially, the release date is Spring 2019 in the US. This AI-powered speaker is ideally meant to sit on a nightstand, as its has a 4-inch touchscreen that displays the time with various clock faces. It has a screen resolution of 480 x 800 pixels, adequate for what it’s trying to show at such a small size. Our favorite feature is the Good Morning dash, which shows off special information when you wake up: the time, weather, commute details and daily news. That's exactly the sort of information you'd want to see when you wake up. The Google Assistant software is the real draw here. Hands-free, you can hear about the weather, your upcoming appointments, set alarms, control your smart home and listen to music with multi-room playback support and Chromecast compatibly. Google’s voice-activated AI has gotten a lot smarter in 2019, rivaling what the Amazon Alexa platform can do. It understands context better than an Echo speaker now. However, don’t be fooled into thinking that just because this speaker has a screen attached to it that it can display anything more than clock faces and the current icon. It can’t. Like the Home Hub, there's purposely no camera, and that’s almost touted as a feature these days. Up top, a plus and minus sign offer volume controls. There's a microphone mute switch on back, with a port for power and a USB port. Why is there a USB port on this thing? To charge your phone at night. This way, you're not losing a precious outlet behind the nightstand to an alarm clock. The Lenovo Smart Clock doesn’t have a stand. Instead, the 6W speaker on the back of the device holds up the screen and is covered in a soft-touch gray cloth. It’s almost as if the 7-inch Google Home Hub was miniaturized. There’s a hint of color on some of the virtualized analog dials, and a few moody blue backgrounds, but you won’t get rich photos or be able to watch YouTube on the 4-inch screen. This isn’t that type of device. It’s a lot simpler than that. That’s where the Lenovo Smart Clock may be a deal-breaker for some people. The Google Home Hub wasn’t much more expensive when it was on sale in the lead up to Christmas, and that version has a 10-inch screen with full color and Assistant screen visual feedback. 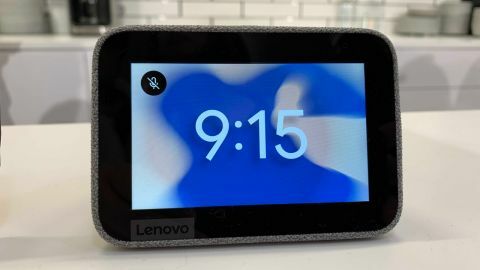 The Lenovo Smart Clock with Google Assistant is a mini speaker with a clock face attached to it and special screens ideal for when you wake up. It’s got all of the smarts of Google’s Home speaker with the added benefit of a 4-inch screen that can display clock faces and, in the morning, the vital information you want to hear about first thing. That’s more than what a screen-less Google Home Mini can do right now. Just know you aren’t going to be able to display photos or watch YouTube on this screen. It’s a great reinvention of the alarm clock, but a much harder sell when the Google Home Hub has been on sale for not much much more money.